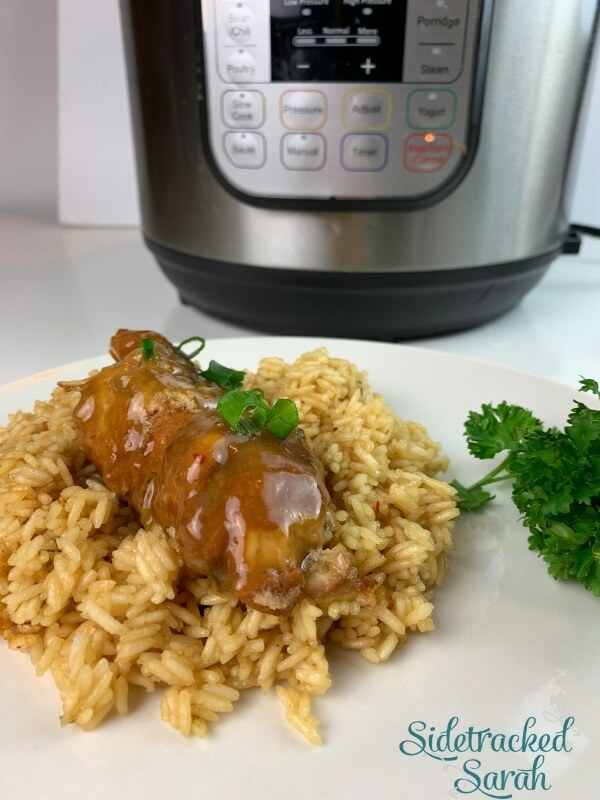 Instant Pot Orange Chicken lets you have the delicious flavors of takeout any time! This recipe is healthy, easy, and ready in just minutes. We love Instant Pot Chicken recipes! Some of our favorites include Grandma’s Instant Pot Chicken Noodle Soup and Instant Pot Chicken Piccata with Creamy Lemon Sauce. When we’re out and about, it’s fun to eat out, and Orange Chicken is one of our family’s favorites. As delicious as it is though, it’s not worth getting the whole family ready to go whenever we want it! While takeout is an option, it can also get pretty pricey. This is where the Instant Pot comes into play! Orange Chicken isn’t just for eating out any more. Now we can have it whenever we want, and so can you! DO I NEED ANY SPECIAL INGREDIENTS TO MAKE INSTANT POT ORANGE CHICKEN? The great thing about this recipe is the fact that there are no hard-to-find ingredients. In fact, you probably already have everything in your pantry or fridge! 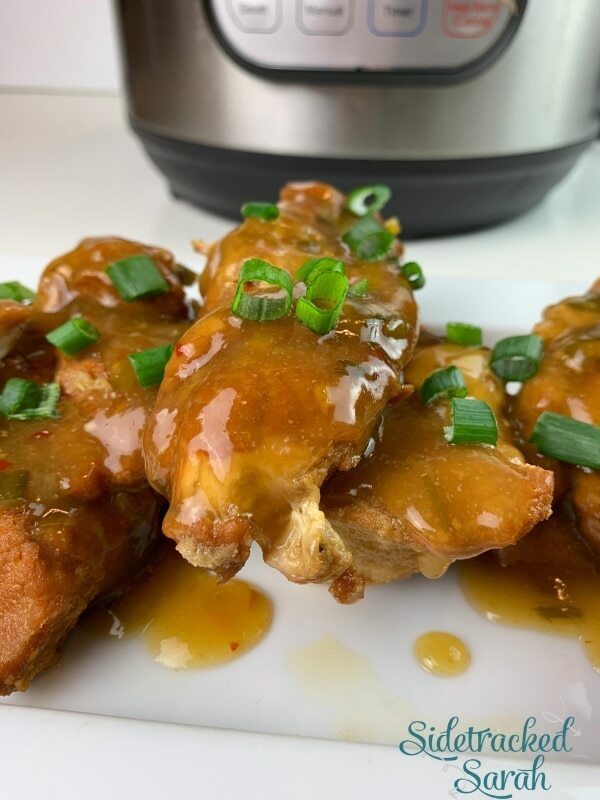 Instant Pot Orange Chicken is easy and fun to make, and it’s even more fun to eat. WHAT SHOULD I SERVE WITH INSTANT POT ORANGE CHICKEN? This is such an easy dish to make and serve, and it really doesn’t need many extras. I like to serve it with some brown or white rice and a simple salad or steamed vegetable. 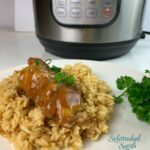 WILL INSTANT POT ORANGE CHICKEN FREEZE WELL? We rarely have leftovers, since this recipe is so delicious, but if you do, they will freeze well. 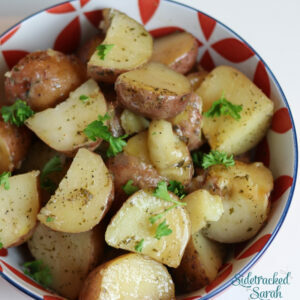 You might even want to make extra to have on hand for lunches or a quick dinner! I hope your family loves this recipe as much as ours does. Enjoy! Blend 1/2 of an orange. Mix together water, orange juice, lemon juice, rice vinegar, brown sugar, ginger, garlic, chopped green onion, and crushed red peppers in bottom of Instant Pot and turn to Saute. Cook sauce for 5-10 minutes, until boiling. 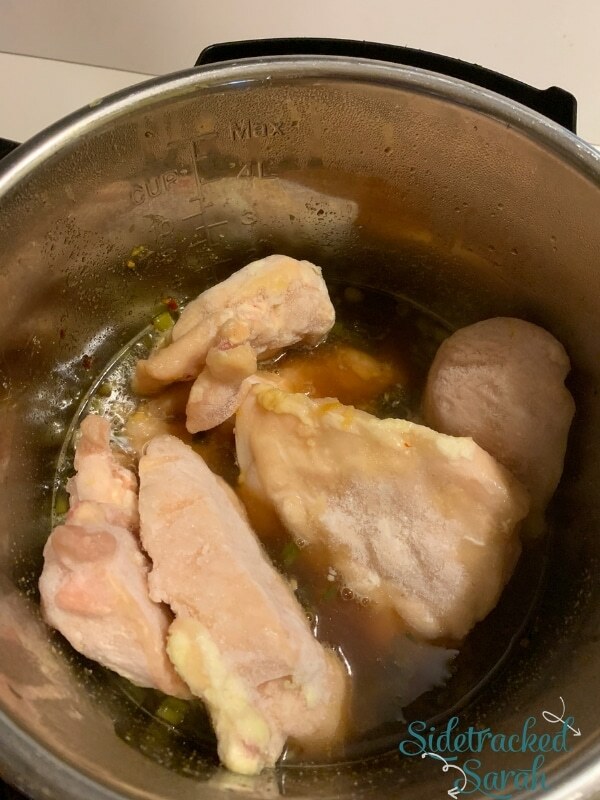 Place chicken in Instant Pot, into the sauce. Close lid and valve. Cook on Manual/Pressure Cook, high pressure for 10 minutes (20 if chicken is frozen). Natural release for 6 minutes, then quick release. Mix together 2 Tbsp cold water with 3 Tbsp of cornstarch. Turn Instant Pot to Saute and cook a bit to thicken. Ladle thickened sauce over the chicken. Use remaining sauce to cook rice in using a 1:1 ratio of liquid verses rice. Cook 2 cups white rice with 2 cups of orange chicken sauce or 1 cup white rice with 1 cup of orange chicken sauce. Cook on Manual/Pressure Cook, high pressure for 4 minutes. Natural release for 10 minutes. Serve orange chicken over cooked rice. My husband recently signed us up for a membership at a fabrication laboratory at our local college. The fab lab can be used for so many projects such as plasma cutting, welding, woodworking and 3D printing just to name a few. It will offer the kids a unique opportunity to become familiar with various platforms. My husband said he feels like a kid in a candy store. Ill update you as soon as wee actually complete a project!